Heat oven to 400° F. Cut squash in half lengthwise; remove seeds. Place squash, cut side down, on large baking dish. Pour water into dish until 1/4 inch deep. Cover and bake 30 to 40 minutes or until tender, turning cut side up halfway through baking. Meanwhile, in medium nonstick skillet, combine sausage, onion, celery and mushrooms. Cook over medium-high heat for 5 to 6 minutes or until sausage is no longer pink and vegetables are tender, stirring frequently. Add sour cream and mustard; mix well. 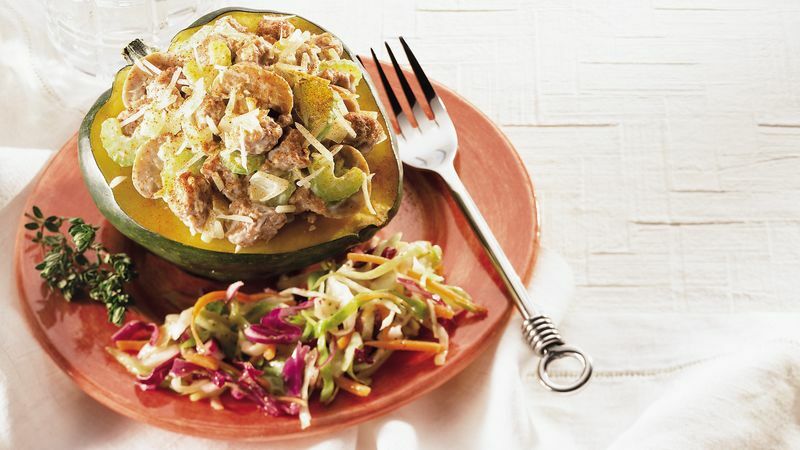 Spoon sausage mixture into squash halves. Sprinkle with cheese and paprika. Winter squash contains carotenoids, plant pigments that color them orange-yellow. Carotenoids are a form of vitamin A that help with vision. Buttercup squash can be used in place of the acorn squash. Buttercup squash is a deeper orange than acorn squash and has a slightly smaller cavity.